On my way home a few weeks ago, I happened upon Lango finishing up a piece of his right around the corner from my house. So glad I caught him in action and realized it was him. It's such an intense, amazing piece -- so much work! Photographer Boogie sent over a ton of images of the many pictures he takes in passing while living in NYC. Monica Canilao & Kyle Ranson in Sweden. Monica Canilao and Kyle Ranson are in Sweden getting ready for their upcomong show, THE MORE WE WANDER at Gallery KRETS. Monica wrote a bit about what they are up to and sent over images of they're fun and work to share with us. I'd like to be frolicing through the woods gathering mushrooms with them, wouldn't you? "We are in Brösarp, Sweden near the coast, doing a make shift residency at a place called Neon Gallery. Though I dont think the gallery is open any longer. The tourist information center is still running which is in the same building as our studio, across from the annex we are living in. The woods here are beautiful and everyone covets their little spots where chantrelles grow. We have been super lucky to already have found several spots of our own! We are basically at a truck stop out in the fields and woods of Sweden, but surrounded by a beautiful epic forest, crazy mushrooms and wildflowers. The tiny town is much like the village in The Wicker Man! At some point in the past, Sonic Youth also did a residency here and recorded a record. We still have one week left and have been working our butts off between cooking super good meals and adventuring into the woods. Our show that we are making work for, 'The More We Wander', will be opening on the 3rd of September here at Krets in Malmö." -- Monica Canilao, August 24, 2011. Want to see more of Monica and Kyle's visit? Check it out here. As most of you know who visit the blog, I have started doing podcasting over the past few months. It's been a lot of fun and definitely added a new dynamic to my life that is really exciting. I've decided to focus more on that and the more personal stuff I cover here and no longer really do any editorial content here. (Also, do you have any idea how long it takes to edit audio -- damn! So much time!) So along with podcasts, I'll also be posting out & about photos (like the one below of Andrew Schoultz' show with Paul Klee at the SFMOMA), studio visits and personal shots of my personal interactions with art and artists here in SF and beyond. I'll also post images from artists elsewhere outside of SF that are shared with me -- mainly it'll all be original content. All good stuff! 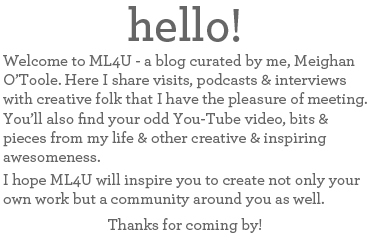 If you are looking for editorial-like content, I would encourage you to follow the ML4U tumblr. I glean from all across the web and from my favorite art sites -- collecting lots of good stuff as I go -- all art related. 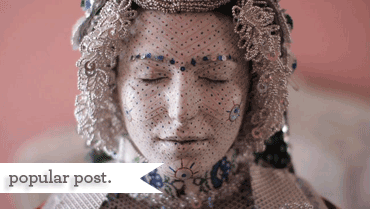 I seem to be posting everyday over there -- so it's a great inspiration portal. So please take a look. I hope you'll join me in this next chapter of the blog. I've been posting in this fashion for over 4 years now and I am really excited to see where this new direction takes me. Lastly, I'm heading to Boston (and possibly NYC) this coming weekend for 10 days, so I'm going to kick off my vacation here on the blog early. ;) I'll see you all in about 2 1/2 weeks! Enjoy the dog days of summer, I know I will -- I'm dying to feel the heat of the east coast. *the above photo is of Scout -- my roommate's girl, in front of an Apex piece off of Market. You can see more like it on Instagram -- naturally my handle on there is 'myloveforyou'.